The Internet has changed our lives forever. Not only is pirating movies and chatting with foreign exhibitionists via chatroulette easy now - selling abroad is a piece of cake too. In terms of profitability it’s an unprecedented advantage - you’re given unlimited growth opportunities, plus, foreign markets are a great chance to escape the soul-crushing repetitiveness of your daily business routine. However, with roses come thornes. To be an international seller, you’ll have to adjust to financial regulations of each country you’re spreading business to and particularly to its tax laws. So, today, we’ll talk about the most noteworthy and globally known tax - VAT (Value Added Tax). We’ll describe its role, and how each country has different rules concerning it. Value added tax, also known as goods and services tax (GST) is paid to the government on each stage of production, as opposed to the familiar sales tax which is applied only when the final product purchase takes place. For a vivid example, let’s look at a production cycle of a ping-pong table. If a lumber company sells wood for 100£, it’ll have to pay 20£ to the government. If table makers sell tables to stores for 200£ - they’ll be obliged to pay 40£ VAT. However, according to the tax rules they are only charged for the value they added, not for the whole thing. So, since the lumbers already covered 20£, table makers are left with paying the remaining 20£. Finally, if a store sells tables to clients for 250£ it owes 50£ from each sale, but will actually pay only 10£, since government has already received 40£ of the tax - 20 from lumbers and 20 from table creators. Okay, I hope you’re not asleep yet. Here is what’s important: VAT is charged in more than 160 countries (the list of them with tax rates can be found here), therefore, it’s essential to learn the special aspects of VAT in the country before entering its market. If you’re running a B2B company, your VAT might be refundable, however make sure to include VAT into prices if you're selling directly to consumers, because in that case, there’s no escaping it. 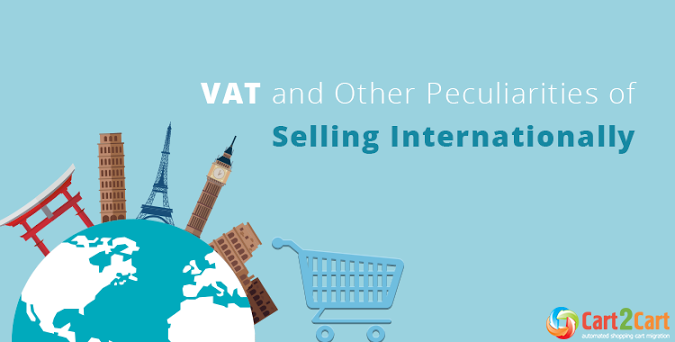 Consider that basics, but still learn, and we can’t emphasize it enough, each country's VAT rules before you start selling - pay close attention to the invoices presenting standards, exchange rates and so on. The scariest part of selling abroad is actually moving goods to consumers. Your delivery methods will also largely affect the amount VAT you’ll be charged with. Taking the importing responsibilities yourself, and thus, dealing with customs and duties. Using dropshipping, and platforms that collect VAT on your behalf. Whichever approach you choose, it will lead you to different consequences VAT-wise. To avoid messing up with VAT, and being penalized, be sure to check VAT government agencies and examine VAT laws each time you’re expanding business abroad. Keep in mind, though, that learning might be difficult due to language barriers, so don’t neglect your local tax consultants - there are always tons of them everywhere. We hope to have raised your VAT awareness, helped you avoid common troubles and expand business opportunities at least a bit. However, the hardest work is still on you - do the research thoroughly, because the payoff - entering foreign markets - is certainly worth it.